Spring cleaning has begun at the Rohde house. 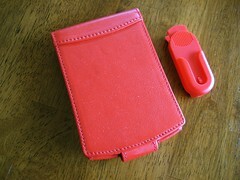 Today I found a very nice, blazing red leather case for a Tungsten E or E2, in need of a good, loving home. Package includes the case and a matching red belt clip, shipped in the original box.